Voice Overs and Voice Over Talent Russ A. Commercial Voice Overs and Voice Over Talent. Need a professional Voice Actor for Film Radio or a TV Commercial? Voice Description: warm, smooth, authoritive, biting. Can exude friendliness, confidence or attitude. From a laid back Sam Elliot, a soft spoken banker or smooth luxury car voice over... Deep and mid-range voice qualities... to a Larry the cable guy country boy to a PBR bull riding or monster truck power read. Experience: 30+ years in major market media, National and International Commercial Voice Over and Narrations. Language: English (North American), Southern Accent, Spanish Accent and several types of Characterizations. Voice Over Talent - Voice Over - Male Voice Over Talent - Female Voice Over Talent - Voice Talent Services - Voice Actors Voice Over Artists - Male Voice Over - Female Voice Over - Professional Voice Over Artist - Professional voice talent services. New York City, Los Angeles, Tampa, Orlando, Miami, Vancouver, London England, Dublin Ireland, United Kingdom, UK and Japan are just some of the places where our voice overs can be heard. Monster Voices, Voice Over Actors and Character Voices. All voice over auditions on request. 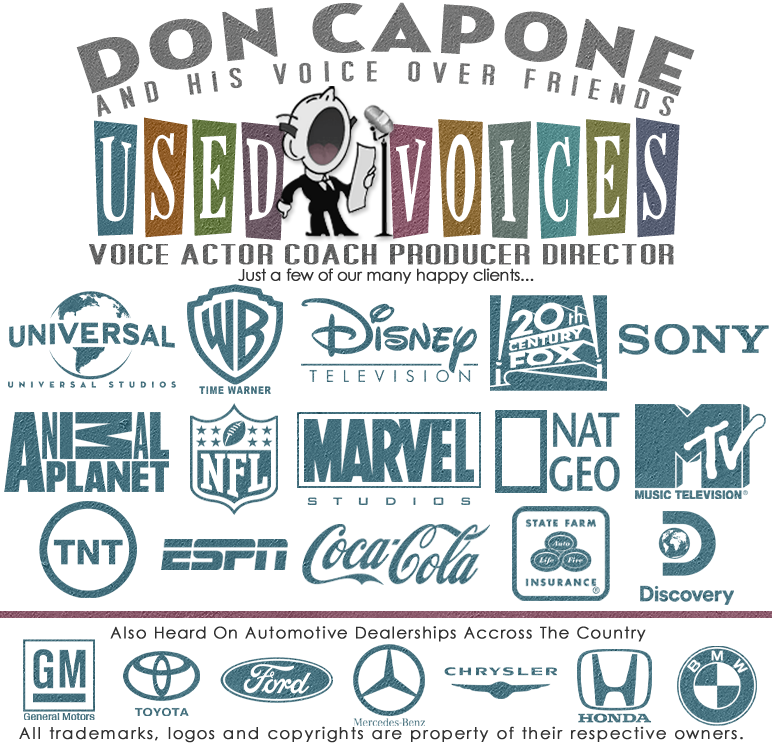 © Used Voices .com Voice Talent all rights reserved. We offer Professional Voice Over Talent and Commercial Voice Overs for all Media.